NOTE: All advice given here are suggestions only. I cannot be held liable for any misunderstandings or issues that might arise by following these suggestions. You are, as always, encouraged to do your own research. Why is it so bloody expensive? Norway’s oil, gas and marine resources has made us one of the richest countries in the world. 5.2 million people share this enormous wealth, and we have a common pension fund that is so large that we could buy Denmark. Twice. This has driven salaries and prices up. But do not worry. Check out the Shoestring Tip section to learn how to get by on a budget. May through September is the best period for biking. Some high mountain passes might not be open by May, so if you’re here early, keep ahead with the weather and driving condition reports. Sometimes it’s really sunny and very warm. Sometimes it pisses down. You never know, so be prepared for everything. But if secured bikini weather is on top of your wish list, Norway is perhaps not the place you’d visit anyway. How do I get there with my bike? You can ride here, of course, through Denmark and Sweden. By ferry it’s unfortunately getting harder. These days, there are only regular passenger ferry connections from Kiel (D), Hirtshals (DK), Copenhagen (DK) and Fredrikshavn (DK) to Norway (they arrive in Oslo, Larvik and Kristiansand). The ferry operators are mainly DFDS Seaways and Color Line. However, there is a back door from the UK. DFDS Seaways operate a freight ship from Immingham (UK) to Brevik (NO). It takes up to 12 passengers (it is rarely fully booked) and your bike, and those who have used it gives it high remarks, even for being pretty affordable. UPDATE SEPT. 2016: Apparently, DFDS Seaways does no longer accept passengers on the route from Immingham. Please notify us if you get any new info on these sad news. If you’re from overseas, I guess you need to contact an air freighter, but I have no experience with this so make your own research. Bike rentals are few and far between. I only know of these. Can I use *any* bike? Yes. I have been touring extensively on a Yamaha WR250R, but have also toured on a Guzzi 1400 California. We have toured with sidecars. My daughter and I have been touring on pizza delivery mopeds. Everything is possible. It’s the mindset, not the tool, that is important. I speak English only – will that be a problem? Not at all. Nearly all Norwegians speaks English, and quite a few speaks German, Spanish and/or French too. Check your road side recovery insurance before you leave. If you don’t have that, call your good friends at the Norwegian Motorcyclists’ Union (NMCU) for help and advice. What if I get ill? If you’re an EU/EEA citizen, your treatment will be covered by the same health provisions that Norwegian citizens enjoy. It is a universal, state funded system of high quality. 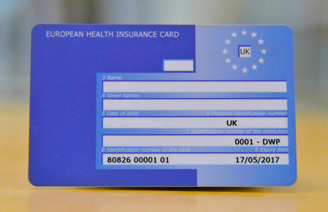 Just remember to bring your EHIC (European Health Insurance Card) to prove your affiliation to your home country’s health insurance scheme. Otherwise, and if not being an EU/EEA citizen, you need to purchase a separate travel/medical insurance. What if I get injured in a crash? You will always get emergency treatment at any hospital in Norway, whatever your insurance status may be. In case of an accident, emergency medics are reached by dialing 113. Will I get mugged or have my bike nicked? Even though we too have our share of petty thefts, especially in the cities, Norway is considered a pretty safe society. Of course there are reports of bikes being stolen and people getting mugged, but fortunately these are rare occurrences. Take normal precautions and you’ll be just fine. If you should experience bad things, contact the police by dialing 112. Any particular animal hazards? Polar bears and stuff? Elk/moose and – particularly in the north – reindeer might pose a risk to riders when they stray out on the roads. In the mountains, you may encounter sheep and sometimes goats on the road. Just keep your vigilant eye out, and slow down if you encounter animals along the road. Mosquitoes, midges and – to a lesser extent – ticks may be annoying so bring a proper repellant, especially if you venture all the way north. We do not have any really poisonous animals or insects to be afraid of, and polar bears are found only at the Spitsbergen islands close to the North Pole, where you wouldn’t bring your bike anyway. We have a small band of wolves in the forests in the South-East close to the border to Sweden, but I have never encountered any of them on any of my tours there. I guess they run off before you can even sense them. What kind of accommodation can I expect to find? Hotels are all over the place, but typically expensive. You might get better prices if you show up at the front desk and ask for a good rate. Sometimes they may offer you a real bargain. Hostels are one of my favorites, as there are quite many of them, they are safe, offer great prices, and you meet great people there. Check out this webpage to find hostels with the right mindset, and get a membership card for even better rates. Camp sites are all over Norway, and they offer everything from a spot to put up your tent to cabins in all sizes and prices. Cabins (“hytter”) are nice to settle into if the weather turns foul, and there are more than 18000 of them scattered all over the country. They are usually very price-worthy, especially if you are more than one traveler, as the price is set per cabin, not per person. The best thing about Norway is the Public Right of Access Act. It give everybody free access to the wilderness, and you can pitch you tent wherever you want to stay a night (not in people’s gardens, please). So find yourself a spot along your route (it’s not hard in this country), pitch your tent, settle in and enjoy your stay! No. The road can be in poor condition, may look like a fire trail or whatever, but you need to stay on some sort of road with your bike. Monetary penalties for getting caught on your bike off road are severe. The traffic is usually slow and polite, and except for in the larger towns of Oslo, Bergen, Trondheim, Stavanger and Tromsø, we rarely suffer from traffic congestion. The traffic laws are being obeyed in Norway, as monetary penalties for breaking them are severe (e.g. NOK 5.200,- for running on a red light). Norway has the lowest accident rate for motorcyclists in the whole of Europe. It’s worth noting that motorcycles enjoy many advantages in the traffic: You may ride in the bus lane, there are no road tolls, rarely tunnel tolls, cheaper on ferries, no parking fees in designated lots, and yes – you are allowed to filter in a queue. What should I do with ferry queues? Norway has many ferries, and you are bound to end up on at least one of them. Fortunately, the crossings are usually short. Here´s how to behave like a native: Always ride up to the front of the car queue. The ferry crew likes to stack bikes where there is no room for a car, so they board bikes first (explain this to foreign drivers in the queue, if they protest). Do not try to embark until clearly signaled by the crew. If the ferry has an open car deck, you can stay by your bike during the short crossing if you wish. If this is not possible, ask the crew if the water is calm during the crossing or if you need to tie down your bike (I have only once tied my bike down during a crossing, which was close to 45 mins long in rough waters). They usually help you with the tie-down. Go to the cafeteria and order “svele” (tastes like waffles, only better), a coffee, and enjoy the crossing. When arriving at the other side: Never start disembarking until the crew clearly signals you. Always obey the crew´s directions, and give them a friendly nod – they help us all getting to the sweet riding spots. All ferries accept cards, and are inexpensive to use. How many days must I spend to go to the North Cape? Plan on spending at least 10 days, plus time to and from Norway. The trick is to race through Sweden and northern Finland, enter Norway and head off to the North Cape. Then you take the spectacular coast road down Norway. You will find route suggestions in this blog. How far is it between petrol stations? Not far. They are all over the place, even up in the sparsely populated north due to the tourist traffic in the summer. In the very few cases where there is a wee stretch between petrol stations, there will be a sign warning you of this so you can fill up at the closest one. Can I use my credit card there? Yes. Norway has a goal of becoming cashless within a few years. Even most parking fee automates accepts credit cards. Debet cards issued by foreign banks with no Norwegian affiliation may be a problem some places, though, so check with your bank before you leave. Which are the best roads? Apart from in the area around the capitol Oslo, you really can’t go wrong wherever you choose to go, but as always: The smaller it shows up on the map, the better it is for bikes. Keep an eye on route suggestions that will constantly be put up on this blog. A good place to start, though, is the webpage for the National Tourist Routes. Norway is all about nature. Some places are out-of-this world scenic. You might get some ideas by following the trip reports on this blog. Also, check visitnorway.com for tips. Why are there so many tunnels? To speed up transit between the towns and cities in mountainous Norway, we need to have tunnels. Some of them are old and poorly lit. The trick is to keep one eye closed as you near the tunnel entrance, and open it again when you enter. Your eye should have adapted somewhat to the poorer light conditions in the tunnel. You can also check the map for an open road as there most lightly is a road somewhere near which the tunnel has substituted. Is it OK to drink the tap water? Yes. Food and water hygiene is top notch. You can even drink water from most lakes (not stand-still water, though) and rivers in the wild. Can I have couple of beers or glasses of wine for lunch? Sure – but then you cannot ride your bike further that day. Norwegian police strictly enforces the 0.02 alcohol limit (which for all practical purposes is a zero tolerance), and driving under influence is severly penalized. You will face heavy fines (even by Norwegian standards), your license will be confiscated and no longer be valid in Norway, and – in serious cases – you will see time behind bars. You will get your license back when you leave Norway, but the police may inform your home country´s authorities, which – if you are an EU/EEA citizen – may cause you to lose driving privileges in all of EU/EEA. The police are entitled to do arbitrary road side checks, and they do this in the most unlightly places, 24/7/365. But you have probably got the picture by now: Whatever you are used to in your home country, do NOT drink and drive while in Norway. Motorcycle heaven, maybe – but not exactly speed heaven? Norway has in general low speed limits, true. But you don’t want to hasten through, as the roads and views calls for a slower speed anyway. Take your time and enjoy your trip! Leave a comment if you have additional questions and/or answers to contribute with! Hello Hans. An inspiring website. Thank you. I definitely plan to visit Norway in July 2017. Here is some further information on the Immingham Brevik Ferry which accepts a limited number of passengers on the DFDS freight vessels. Passengers are accepted (subject to schedule) on a Sunday from Immingham and Monday, and Friday from Brevik. Passengers cannot be confirmed for more than 30 days before the sailing date, although they accept reservations NO more than 10 weeks before. Please note all reservations are taken on a first come first served basis. Passengers under the age of 5 are not accepted. Excellent info, thanks! Will include it in the pages. I have phoned DFDS in May and was told that passengers are no longer accepted on freight ferries. On their website is no option too book with the bike as well. The prices you have shown…where have you digged it from please? Hi Jakub. Victor’s post is from prior to DFDS stopped accepting passengers on their freighters. Hi Hans, a really useful read and much appreciated. I am riding to Norway this August (2016) for the first time. Great! Welcome! What’s your plan? Hi again, in brief it’s a ferry to the Hook on 6th then a stopover in Hamburg before riding up through Denmark and Ferry to Norway. We then ride up to the Arctic Circle before heading back. I’m not yet in possession of the itinerary (it’s a trip organised by White Rose Motorcycle Tours) but am very much looking forward to seeing some of the beauty and culture of your country. Hi my name is Roshan. Myself and a friend will be riding in Norway and Sweden, probably in late may or june 2017. We have started planning for our trip and would love if you could recommend some routes for us. We will be travelling fronm dubai and rent two bikes for the ride. We would also really appreciate any help you could provide in the form of trips or if you know any groups that we could tag along with. we will be on a shoe string budget as we love riding and would love to explore your country and traditions. Hi Roshan, and welcome to Norway! Please browse these pages for route and also shoestring tips. After this, let me know if you have more spesific wishes. Norway has a lot to offer, so everything is possible. It also depends on how many days you will spend. Roshan when are you travelling? May be we can club together? Of course, you would need at least 3rd part liability insurance. Not too familiar with insurance on foreign bikes, but will dig a bit. I am guessing it’s difficult for non-Nordic or EU citizens to insure anything at all, though. Is your current insurance not valid overseas? I stumbled upon your blog while making some research. I am from Vietnam. Hiking Trolltunga and having a motorcycle trip across Norway has always been my biggest dream. I’ve just finished my 2,500 km/10 days trip across Vietnam with my KTM Duke 250 and I know now is the time to make my dream come true. My main priority is Trolltunga, Atlantic Road and Lofoten Islands. So, here’s my plan for the 1st week of September https://drive.google.com/open?id=15lwgl6wrqAt3SqDqWpoaMsLsfrM&usp=sharing . (I’ve done some research and they say Trolltunga is still available for hiking until mid-September). I’ve checked this site https://www.edelweissbike.com/en/mieten/ . But it seems that I have to book the whole tour and the rate is quite high. Hi Duong, good to hear from you! I hope you can make it here – Trolltunga is quite a sight! Rental bikes in Norway are few and far between, usually due to high insurance premiums on rental bikes. There are a few, though, and prices typically hovers around NOK 8000,- pr week, and these bikes are usally 650 ccm and upwards. I would assume that as long as you hold an internationally valid license for motorcycles, you would be insured through the rental agreement. However, I would inquire about this at the bike rental. You could also seek information at the Norwegian embassy in Hanoi, http://www.norway.org.vn – although I am not sure if they have info regarding insurance. For bike rental, check out these: http://www.monsterbike.no/mc-utleie-481.aspx – use google translate. Duong, we are doing an trip from June 16-23rd 2017 and are taking bikes from Kawasaki Distributor Mcpartner AS. This is Versys 650 GT with 3 hard cases. If you want you can join us on the trip. Reply to this comment and we can get connected. Thank you for your invitation. I really want to join you guy but unfortunately, my plan has changed to 2018 due to an unexpected situation. Looking for the best site to find a used motorcyle in Norway… can you recommend one? Hi, welcome to Norway! I am sorry but I do not know of any rentals in the Bergen area, which is not to imply that there are none. I am just not aware of any. Although you could try Team MC Bergen. I see from their web site that they offer rentals: post@team-bergen.no. Hello Hans! Nice website you have. I have a question. Me and my girlfriend are planning to do a big tour from southern Sweden up to Lofoten (through Sweden) and then all the way down to Brevik. We have 30 days for this trip. You think its possible or a little bit too much. Thanks in advance!! Hi, and welcome! 30 days? It’s easily filled but you could cover the whole country top to bottom with that much time. If you want to do some hinking in between the rides, you’ll have time for that as well. More time to explore! Is a helmet mandatory on motorcycle? Hi, yes – mandatory since 1976. Anyway dear fellow two wheeled riders, I bought a return ticket from Harwich to Hook of Holland ( £246 including my own cabin and breakfast each way). Only please, i have beeñ a little silly and went right off for the cheapest version. The version which is only £20 squids dearer than what I paid for. BUT, i allows you to amend or cancel the ticket with refund. In case ypu need to cancel the trip. Just for your info. I have canceled my original plan to run through Sweden up to Nordkapp and back down through Norway. I have 18 days for my HOLIDAY😊 I had worked out quite sophisticated itinerary, but it involves over 450 miles/ day of ride. Doable. But where is the holiday people? It worked out over 4500 miles for the whole trip. No. Hi, Thanks for the useful website. Quick question, when is the earliest we can visit Norway this year (avoiding the snow). We would like to ride up to the Nordkapp and wild camp some of the way without encoutering snow on the roads or being too cold at night =). Hi Sean. For Nordkapp I’d say June. Thank you for the quick reply, if we only went as far as Korgen, would the roads be snow free a bit earlier? Yes, you can ride to Korgen and even further north earlier. The trick is to stay in the lowlands, where there are no problems even in May. However, come mountain passes, and you might find closed roads. E.g. the Trollstigen usually opens late May. One can also encounter rough weather over the Saltfjellet – but the roads are usually not snow covered. I say “usually”, because freak weather *might* occur. You can also aim for Nordkapp after mid-May. Last year, 11 May saw the toasty temp of +16.7C, and (I assume) clear roads. However, 1 May it was -1.4C – so you never know at that time of year. If – say – the Arctic Circle is your aim, I’d ride to Trondheim, then take the Coastal Road 17 to Bodø (slower, many ferries, but extremely scenic and no high mountain passes). From there, you could play it by the ear, so to say, by checking the weather forecast further north. Good luck – and welcome! Hi! Really nice website with a lot of info. I have a question about the required “accessories” by law in Norway. What you must have with you while traveling on a motorcycle? With a car you are supposed to have first aid kit, reflective vest, warning triangle, fire extinguisher (at least in my country). I couldn’t find the requirements for motorcycle in Norway anywhere. Hi there, Stefan – welcome to Norway! The only requirement is to carry on your bike a reflective vest in case of breakdowns along the road. First aid kit is recommended, though. Thanks! I think first aid kit is always nice to have when you are traveling. I’ve been in Norway since 2015 and have traveled with a rented car, but I finally decided to buy some motorcycle and do some more sightseeing in a more enjoyable way. Your website would be of help to me for sure. Booked the ferry heading NOR last night – discovered your blog this morning. Exactly the place I hoped to find. And already seen a few things confirming my intentions 😉 Will get back to you when questions rise. My wife, my bike (a Norge, indeed) and me, best regards. Hi, Is it possible to ride a classic 2- stroke motorcycle in Norway?